Categories: Driver Qualifications, Products. Tags: Driver Qualifications, Driver's Employment Application, Employers. • Designed especially for drivers with more than three previous employers. • Be sure to have enough on hand for walk-in applicants. • 8 1/2″ x 11″. 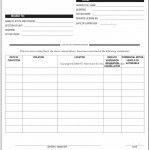 • 50 forms per package.